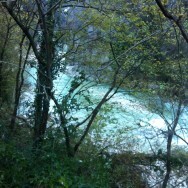 The Marche (pronouced Mar-Kay) is a region full of surprises! It has such a lot to offer. Situated a third of the way down the Eastern (Adriatic) side of Italy, sandwiched between Emilia-Romagna to the north, the Abruzzo to the south and Umbria, Lazio and Tuscany to the west and inland. It’s a region that often gets forgotten and overlooked, overshadowed by some of its more famous neighbours, but it deserves more attention. 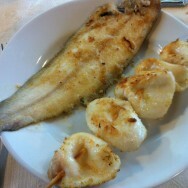 The Marche is surprising in its riches. It has breath-taking snow-covered mountains inland where the spine of the Apennines form a backbone through Italy from north to south. Inland too, away from the coast, the landscape is full of undulating, wooded hills, peppered with picturesque towns and villages and fast flowing turquoise-green rivers. Wood smoke fills the air in the cobbled, steep streets of the many walled medieval towns such as the famous towns of Jesi and Urbino. Jesi is known to many wine lovers as being the source of one of Italy’s most famous dry, white wines, Verdicchio dei Castelli di Jesi. Over the years as I have taught wine courses and talked about the crisp, dry white wine with the long name, sold formerly in the distinctive amphora-shaped bottle, I have wondered what that town was like; a town called Jesi – it sounded magnificent to me! Here in this part of Italy, the papal influence is very strong and is seen everywhere in the statues and architecture of the major towns. Heading on out to the coast, another landscape takes hold, one where a dramatically beautiful coastline dotted with colourful seaside towns captivates the imagination. 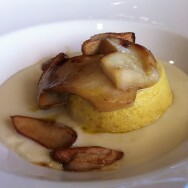 The food is equally varied: local specialities include rich mountain dishes such as polenta with a creamy, truffle sauce or wild boar ragù with tagliatelli or sformata (a cross between a cheese mousse and a soufflé) with porcini mushrooms. Meanwhile the coast affords some of the most delicious, freshest fish, such as freshly-caught sole, mussels and crayfish which are often combined into rich seafood, tomato and pasta dishes. They also produce a lot of delicious, strongly-flavoured, dark green olive oils here too. There is a huge variety of dishes and something to please everyone. As for the wines, the best examples were truly a revelation. Before I came to the Marche I had tasted many of those wines we usually see in the UK – those crisp but fairly neutral, dry whites of Verdicchio dei Castelli di Jesi DOC and I knew something of the reds, such as Rosso Conero DOC, made using local grape varieties Sangiovese and Montepulciano. I knew some of the leading producers such as Umani Ronchi and Garofoli but there were a lot of surprises. The first was that Verdicchio Dei Castelli di Jesi can age! Some of the best wines I tasted were from 2008 (a very good vintage in Marche) or older. When they age they develop deeply honeyed, acacia aromas and flavours and the best have a soft, richly creamy mid-palate balanced by an attractive bitter almond flavour that adds length to the wine. Also surprising were the wonderfully aromatic red wines of Lacrima di Morra Alba. ‘Lacrima’ is a lovely Italian word meaning ‘tears’ and is where the English word ‘lachrymose’ comes from but in this case the grape gets the name because the berries can split easily when ripening and little ‘tears’ or rivulets of juice form and run down the skins. Even more unusual is a sweet, sparkling red wine, confusingly called Vernaccia Di Serrapetrona (confusing because in Tuscany, Vernaccia di San Gimignano is a well-known dry white wine). It produces a fun, lively, sweetly fruity wine and is a very quaffable, delightfully light-hearted drink. Move over sparkling Shiraz! Another discovery was Verdicchio Di Matelica DOC, less well known, but in fact an older DOC than its more famous neighbour Verdicchio Dei Castelli Di Jesi. There are the well-known dry reds of course made under the DOC of Rosso Conero. This DOC is named after Monte Conero (Mountain of Conero) and is the furthest place north that Montepulciano will ripen and grow. The name ‘Montepulciano’ means ‘beautiful mountain’ – could it refer to Monte Conero? Then there is the characterful range of red and white sweet wines made from drying the grapes in rooms where the air is circulated. The drying period is called the Apassimento and the wines are called Passito. On top of all this I tasted some lively sparkling wines, both pink and white, from grape varieties such as Pecorino and Passerina among others. So apart from its famous dry white wines the Marche offers an eclectic and characterful mix of wines of all colours and styles that deserves to be better known in the UK. By the way, the Marche has four DOCG’s and twelve DOCs or DOPs and has received the highest number of Gambero Rosso’s Tre Bicherri (literally translated as ‘Three Glasses’, the Italian equivalent of a UK gold medal for wines) for white wines in the whole of Italy. It wouldn’t be right to continue without mentioning some of the best wine producers and wines of the region but this is just a small selection based upon some of the wines that won prizes in the Marchet Wine and Fish competition. 2008 Grancasale. I was told 2008 was a very good vintage in this region. They had very few bottles of this left so it was generous of them to open this one. I loved the chalky, steeliness of this wine combined with a creamy richness too. Honey, ripe yellow apple aromas and flavours. So smooth on the palate, silky and round with creamy yellow fruit balanced by a chalky, savoury finish. A little Burgundian in texture and weight but with distinctively Italian aromas and flavours. 95/100 My favourite of the whites! 2010 Crisio Verdicchio dei Castelli di Jesi. The grapes were picked around the 20th of September and fermented, but not matured, in oak. Aged ‘sur lie’ for 2 months and bottled 18 months after harvest. Described as good with truffles, white meat and rabbit. Bright green, peridot tones. Subtle nutty nose with gentle sweet oak notes. Soft and creamy with a satisfyingly round middle, a curvy wine with some subtle sweet chestnut and spice notes and a little lift of fresh acidity and chalkiness towards the end like a refreshingly salty sea breeze, swiftly followed by a bitter almond finish. 95/100 This wine tasted at dinner two days later was one of the exceptional wines of the night. A few weeks later I read this wine had received the much acclaimed Tre Bicchieri, Gambero Rosso’s highest award for wines. 2006 Grancasale. Deep yellow gold – Sauternes-like colour. Evolved nose of yellow plum and mushroom (“and Cypress resin” says the winemaker). Very soft, velvety start and a rich, smooth palate, with mushroom/truffle flavours. It was great to taste such a mature style but I prefer the feistier 2008 version. We also tried an attractive sweet Cimaio Marche 2009 (15%), affected by noble rot. This is a small family producer that I made a special arrangement to see and who kindly came to collect me at the hotel. They have 21 ha in the valley of Morro D’Alba (the name translates as ‘centre of the dawn’) and are making some very exciting Lacrima Di Morro D’Alba. This is a quirky, characterful, red grape producing aromatic, concentrated dry red wines, which have some similarities with the powerful dry, port-like styles of Valpolicella Amarone. Vicari’s Lacrima Di Morro D’Alba wines are heady, fragrant, dry port-like wines with alcohol levels of between 14 and 15.5%. I was given an extensive tasting of their wines. They make dry whites under the Verdicchio dei Castelli di Jesi Classico denomination and some very attractive reds, the Rosso Piceno 2011 (70% Montepulciano, 30% Sangiovese), being a good example. But their real speciality and strength is in their ability to coax the best out of the intriguing Lacrima Di Morro D’Alba. The wines below were excellent. Lacrima del Pozzo Buono 2011, Lacrima Di Morro D’Alba Superiore – 15.5%. This wine won a gold medal and a trophy in the IWC competition in London for the 2011. Black core, magenta rim. Ripe cherries soaked in alcohol and a Turkish Delight nose. Very rich, smooth and densely concentrated palate balanced by a dried plum-skin tannic finish. Firm tannins contrast beautifully against the richness of the ripe, dark- cherry fruit and the velvety texture of this wine. Powerful – rather like a fruitier and more aromatic Amarone. 96/100 This was followed by two lovely but very different sweet wines: Vicari L’Amabile del Pozzo Buono – 14.5%, made with Yellow Muscat. The grapes are harvested at the end of September and are then dried for three months. Only 1500 bottles are made. Deep orange gold. Honey, Muscat grapes and marmalade nose. Sweet wine but with contrasting orange marmalade flavours. 92/100. Garofoli are one of the Marche’s benchmark wineries with 50 ha of vines and a production of almost 2 million bottles exported worldwide. I was guided around the wine cellars by the ebullient matriarch of the family – Daria Garofoli who pointed out the prototypes and historical examples of the famous amphora-shaped bottle that used to be the traditional bottle for Verdicchio dei Castelli di Jesi. The curvy shaped bottle was better known as the ‘Lollo’ after the voluptuous Italian actress Gina Lollobrigida. What started as a great marketing idea (the distinctive bottle shape eased customer recognition) became a weight around the neck of the producers as the image of Verdicchio dei Castelli Di Jesi became impaired by inferior quality wines. 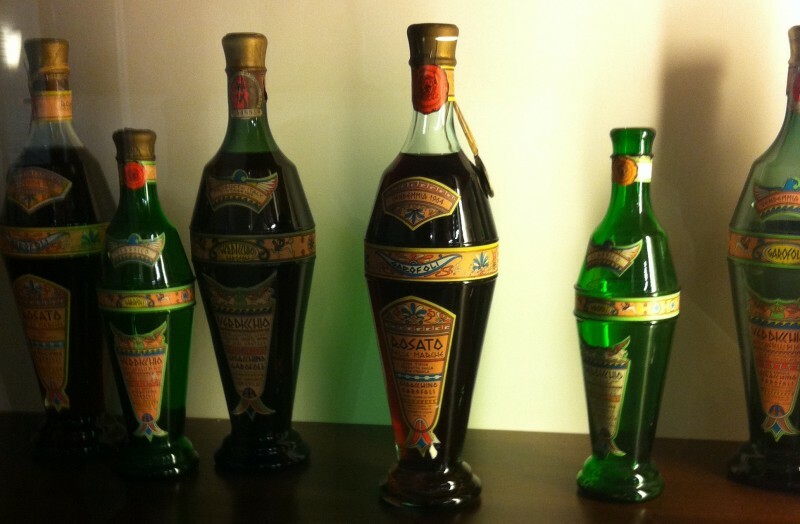 After using this bottle shape for some years, Garofoli were one of the first to do away with it. This was one the best tastings of the press trip because of the quality of the wines and the breadth of the tasting. It was so useful to taste several different vintages of the same wine side by side to really see how the wines age. As well as the entry level Serra del Conte 2012, Daria generously gave us an impromptu tasting of several vintages of their much acclaimed Podium wine including the 2011, 2007, 2006 and the 1999 vintages and their flagship, top-of-the-range white wine, La Selezione 2006. We also tasted Serra Firorese 2008 and two reds: the Piancarda 2010 Rosso Conero and the richer Agontano 2008 (both 100% Montepulciano) followed by a zesty sparkling wine, the Garofoli 2007 Brut Reserve. The Garofoli La Selezione 2006 was the star of this tasting for me. Bright green gold, very shiny and luminous. On the nose, delicate China tea and smoky notes combine with cream and acacia honey. There is a youthful, vibrant feel to this wine with a fabulously seamless texture. Candied lemon peel, cream and a touch of sea salt flavours intermingle and blend on the palate through the effortlessly silky texture. Very fine! 96/100. Only made in 2006 & 2008. I also loved the 2006 Podium. It had some of the same signature notes of acacia honey and cream and the silkiness of texture balanced by a little sea salt, lemon and mineral flavours. 95/100. The 1999 Podium was a joy to taste and was obviously a more mature wine. Rich green-gold, Sauternes-like colour. Beautifully fragrant nose with ripe apricot and lime leaf aromas. Silky-textured, seamless with a long finish and delicately contrasting flavours of salt, lime peel, cream, honey and China tea. Lapsang Souchang smokiness lingers on the finish. Unusually, it was suggested that we take all of the open bottles of wine with us to our seaside fish restaurant to drink with lunch. What was interesting was that the less powerful and less complex Podium 2007 did best with a rich seafood pasta dish and the delicate fresh sole. I have often found that a more subtle and understated wine works better with food as it allows the food to shine instead of competing with it. I was told later that Gambero Rosso judges taste the same 30 or so, potential medal winning wines all day with and without food. If this is true, it seems like one of the best systems of judging a wine fairly to me. Two nights later at a dinner at Fortino Napoleonico (www.hotelfortino.it), one of the Marche’s best known fish restaurants on a hillside overlooking the sea below Ancona, we were also able to taste the Podium 2008 which we had not been able to try at the winery. 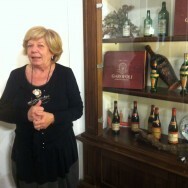 No visit to the Marche would be complete for me without visiting probably the most famous wine producer of them all. As a student learning about wines myself, Umani Ronchi were the Marche producer, so although they were not part of the official press trip I decided I had to try and see them. Once family-owned by the Umani Ronchi family they are now owned by another old, prestigious Italian family, the Bernetti family. Old Italian families in my experience have a lovely tradition of extreme graciousness towards guests and the honour of the host is invested in providing the most courteous hospitality. The constraints of the trip meant that my visit had to take the form of a quick call at the winery on my way to the airport with hopefully a brief tasting of some of their wines. What they arranged was to collect me from my hotel, treat me to a very generous tasting of several vintages of their wines before delivering me to the airport, all with the courteous presence of the owner, Massimo Bernetti who made a special visit to see me. I felt honoured that Massimo had taken the trouble to meet me in person. He struck me as someone who was very humble, relaxed and at ease with himself and he quickly put me at my ease too. He told me they were the first producer to stop using the amphora-shaped bottle in 1983 and to put their Verdicchio dei Castelli di Jesi into a Burgundy-shaped bottle. It was a brave move at that time when the ‘Lollo’ was such a well-known brand! I was given an excellent range of wines to taste starting with their entry-level Casal di Serra 2012 Verdicchio dei Castelli di Jesi, then the Vecchia Vigne 2012 and three vintages of Plenio, the 2009, 2004 and 1999. Plenio is their top quality Verdicchio dei Castelli Di Jesi that is matured for 18 months before being put into 500 litre oak barrels for further maturation. Below are just a few of the wines that impressed me most. Maximo Sauvignon Blanc 2010. Orange gold, very cleanly botrytised wine with just a little pure orange zest and orange marmalade notes. Pure, clean, lively aromas. Sweet but juicy, lovely combination of sweetness and refreshing, lively acidity, honey mixed with notes of orange zest. Beautifully balanced wine. 95/100. One thing that struck me is that the reds they make are every bit as good as the whites, sometimes even better and it is unusual to be equally good at both styles. In fact with their red wines they won the Red Winemaker of the Year award at the IWC a few years ago. Other wine producers and wines to watch. Guerrieri are a small family company, 6th generation with 200 ha of land and have been here since the late C18th. They have 35 ha of vines, producing 150,000 bottles, plus 20 ha of olive trees, 95 ha of cereal and the rest is woodland. ‘Guerrieri’ means ‘warriors’ and they like to think of themselves as warriors of the land. What I loved about this visit is their holistic approach. 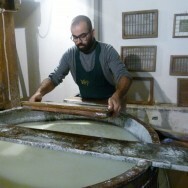 They pride themselves on being self-sufficient and make their own deep green, full-flavoured olive oil as well as their own pasta and of course the wines. They even run a sort of B&B house rental in an attempt to attract more tourists to stay. Their teaching farm, populated with chickens, geese and stray cats is used to educate children and young people early on in the joys and health benefits of eating healthy, home grown, unprocessed foods. Their website – http://www.aziendaguerrieri.it/en/ – is well worth a look. As for the wines, they produce 60% white, almost 40% red and a little rosé. For the whites they use the less well known Italian white grape variety, Bianchello. Although the whites were fine on this tasting I liked their red wines best, especially the Guerrieri Nero 2011 (33% Cabernet Sauvignon, 33% Sangiovese and 33% Merlot) – concentrated, chunky and robust without being hard or bitter. Also very attractive was the Colli Pesaresi Sangiovese Riserva 2010 (14%) – a smoother, medium bodied wine with some attractive bright cherry fruit. As well as finished wines we tasted two very different tank samples of the Bianchello del Metauro 2013. A combination of the two seemed very promising, one more nervy with high acidity, the other rounder with yellow fruit and honey flavours. Centanni are a small family company based at Montefiore all’Aso who specialise in organic production. They produce 120,000 bottles annually. We were greeted by the young brother Giacomo, who makes the wine, and his two sisters who together run the company day to day. The wine business is in their blood – their grandfather was a grape grower who sold grapes to the local co-op. They make a few slightly different wines such as an attractive dry, white, sparkling wine made in the classic method from Passerina and which spends 12 months on the lees. Then Giacomo decided to show us his latest red wine cuvée which as yet had no name. He kept the blend secret and wanted us to try to guess it. So far as maturation was concerned, this wine had had one year in stainless steel, one year aged in concrete (the very latest fashion in many top wineries and with good reason, if the results are anything to go by) and six months in large oak botte. I guessed correctly that part of the blend was the exotic and aromatic Lacrima di Morra D’Alba and there was also some Cabernet Sauvignon in there as well as other varieties. This 2010 ‘red with no name’ was my favourite wine here but it was not yet in bottle. It was a deep, dark purple wine with an aromatic nose of roses and heady, port-like, ripe cherry notes, with good concentration and finely textured tannins. It is still young and needs another 2-3 years to begin to be at its best. According to our host, it will be ready to start drinking in 2015. They only make 1000 bottles a year and say it needs 3 years maturation and will probably be priced at 25 Euros, the problem with that being, in the UK, the ex-cellar price will usually be tripled by tax, duty and margin so that would in effect price it out of our market. Pity! As it was not bottled I didn’t give it a score but it was their best wine. 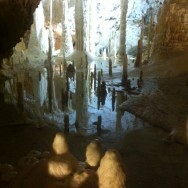 What was fun about this press trip was that it combined cultural activities such as a visit to some extensive and very impressive caves – the Grotte di Frasassi (www.frasassi.com). These caves were discovered by chance by a group of local cavers in 1971, situated 7 kilometres south of Genga. Rich in water, this cave system is particularly well-endowed with stalactites and stalagmites. Before visiting I was not sure how interesting I would find this but the caves are so vast, so well lit and our guide was so enthusiastic that it was a captivating way to spend a couple of hours. It would be a great place to take children with their active imaginations as the huge stalagmites create a fairy tale landscape with varied features with names such as, ‘The Candle Lake’, ‘The Polar Bear’ and ‘The Organ’. There is even a barrel of Verdicchio dei Castelli di Jesi ageing in the special conditions so as to see how it affects the maturation of the wine. We also visited Fabriano, a paper mill with an ancient tradition of making paper from cloth that goes back to the XIII century. Our guide gave us some of the history of paper making while we looked at the traditional machinery and were shown the various stages of paper making. Again it was a fun way to while away an hour or so. 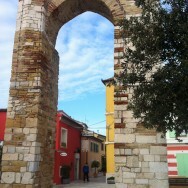 The trip also combined some wonderful coastal vistas along the Marche coast with as we stopped off in the colourful seaside towns of Numana and Sirolo. Even in the middle of winter they provided a bright and uplifting interlude with their colourfully painted houses and streets. Meanwhile, inland we visited the impressively beautiful, medieval walled towns of Jesi, Loreto and Urbino. Jesi in particular seemed to be buzzing with life and vitality on a Saturday night in early December. These visits were all too brief but enough to make me want to return and get to know the Marche region much better. Grateful thanks go to Michèle Shah and to the sponsors “MARCHET” (Azienda Speciale della Camera di Commercio di Ancona) for a memorable trip. © 2014, Susan Hulme MW. All rights reserved. Wine fairs, useful as they are, are usually hard to get too excited about. Essência do Vinho is a stunning exception – it is actually a very exciting event! ©2012 Susan Hulme MW. All rights reserved.